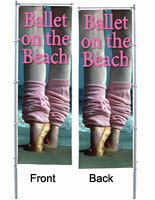 Does your business need replacement banners for your 13’outdoor signs? 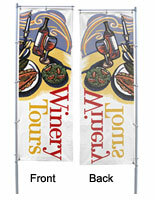 These advertising banner flags are sold individually and feature several different printing options. 13’ replacement banners offer the opportunity to update your large outdoor advertisements without replacing your entire sign display. 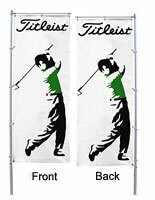 These are the same flags that are sold with the full 13’ kits. 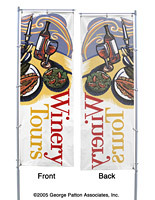 These replacement banners, also known as TriPole flags, are designed to fit with our medium sized flag and banner holders. These graphics are available in one, two, three, or full color silkscreened printing, full color digital printing or full color dye sublimated printing. 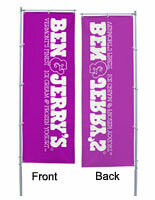 For any silkscreened advertising flag banner, a minimum 10 unit order is necessary. 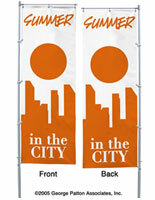 These promotional business sign fixtures are suitable for simple designs and logos that include little detail. 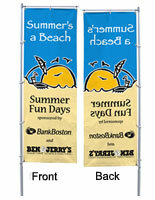 There is a choice of one-color, two-color, three-color and full color graphics. See the vector artwork submission link for further information on designing images. 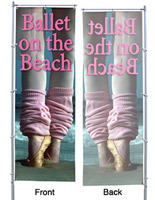 Vinyl imprinted displays use colors that penetrate the textile for mirrored imagery on the reverse side. 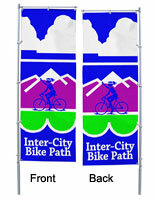 Even though they are through-printed, the decorative business banner flags are just as bright on both sides. A digitally made print does not have a minimum batch quantity required. Photographic images are rapidly rendered using digital printing. This option is the best choice for more complex designs, such as artwork with gradients. 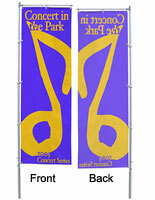 These models can be printed as single or double-sided displays, though, through-printed models generally experience 15% fading on the opposite side. A reverse image is seen on the back panel. The dual models are produced independently and then affixed to one another.